Whether this is your first time in the Algarve or the latest of many visits to the region we are sure that there will be something new and beautiful for you to discover. Old Village is a beautiful, tranquil and family-oriented resort in Vilamoura, one of the most popular destinations on the Algarve. We can offer you a full range of comfortable and well equipped holiday apartments (studios, one, two and three bedrooms) and town houses (four and five bedrooms), which can cater from 2 to 10 people. 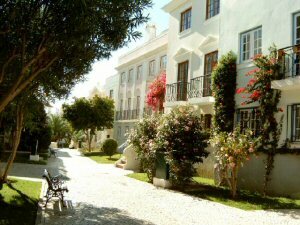 All the apartments have either patios or roof terraces, overlooking the beautiful gardens and pathways of the Old Village. The resort is peaceful and you can enjoy warm temperatures all year round. It is situated just 10 minutes (walking distance) from the splendid marina and 25 minutes (driving distance) from Faro International Airport. The accommodation is well equipped with private bathroom, kitchen (with washing machine, microwave, cooker, fridge with freezer, kettle and toaster), television and satellite, patio or terrace. Some of the apartments have air conditioning and heating (please request if required). Laid out on a virtually flat terrain, it includes a series of mounds specially landscaped to emulate the outline of the inland hills on the horizon, a feature that provides the course with a sense of movement and harmony. Designed by Frank Pennink and opened in 1969, this is one of Portugal's best known golf courses internationally, especially for the outstanding way the layout was moulded to the natural contouring of the terrain and integrated to the surroundings. Recent upgrading and modernisation has brought the Old Course up to a new level of excellence, enhancing the image that made it famous. All the holes have their own individual character, making each one truly memorable. The first five holes are relatively straight forward, allowing players to gain confidence and build a good basis for a good score. Holes 6, 7 and 8 however, bring one back to the reality of a course that demands complete concentration and precision shot-making. To score well on the outward half, the short but extremely well defended par-4 ninth must be negotiated. Players must draw on all their strategic and golfing abilities to avoid trees and bunkers. On holes 10, 11 and 12 achieving length and accuracy off the tee is the real test. The following trio of holes afford some respite before one faces the 16th, the best par-5 and last truly challenging hole. The two closing holes give golfers a chance to score well, giving them back a pleasant memory to take back to the clubhouse. Prices include daily maid service except Saturday, Sundays and Bank Holidays. Bed linen is changed weekly. Towels are changed once a week. The maximum number of people in the apartment is strictly limited to the number of beds provided. Prices include maid service and towels three times per week. Bed linen is changed weekly. Holiday Inn Express Nanhuizui Shanghai - We are here to assist you while taking an amazing tour of the Shanghai Pudong (PVG) Airport area. need cheap hotel near LA downtown? - We are honored to be your guest and help you get the best of Downtown LA. click here for cheap hotels munich - Forget about your daily worries and enjoy your holiday! accommodation close to rome spanish steps - We are here to offer suggestions for the best shopping, dining and entertainment spots that can be found near Spanish Steps. book online cheap hotels Luxury Hotels in Paris - Welcome to Luxury Hotels in Paris! cheap accommodation at Newark airport - Hotels Newark Airport can guide you through this city. try this site for hotels close to Barcelona Las Ramblas - WELCOME to Barcelona Hotels Las Ramblas! try this site for hotels close to Strasbourg Centre - Hotel Strasbourg Centre is gladly welcoming you to our locations and is pleased to be your host.